Introduction: Hearing impairment in the elderly causes incapacity to advise to need of a care provider. Objectives: To assess the quality of life of care providers of hearing disabled elders and identify the role-played by the use of hearing aids in the quality of life of care providers of elders who use or do not use hearing aids. Methodology: Thirty care providers were interviewed, divided in two groups considering the use or non-use of hearing aids by the elderly. The first group comprised 10 care providers of elders who used hearing aids, and the second group comprised 20 care providers of elders who did not use. An interview and a questionnaire to assess quality of life, from the World Health Organization, the WHOQOL-bref, were used for the assessment. Results:The sample was predominantly by female care providers (80%), with average age of 58.5±13.07 years. By the total, 96.5% were family members of the elder individuals. Regarding quality of life, it was noticed that it was less compromised in care providers of elders who used hearing aids, mainly in the social domain. It was found a correlation between the age of the care providers and the psychological domain, and between the number of drugs used by the care provider and the physical domain of the WHOQOL-bref. Conclusion: The results suggest that quality of life of care providers of hearing impaired elders is affected. The usage of hearing aids by the elders seems to provide for the care providers' quality of life. The elderly population, which is made of individuals who are 60 years (1) old or more in developing countries, is the one which grows the most in current society. Until the 1930's, life expectancy was not higher than 50 years old. Nowadays, in developed countries, life expectancy overcomes 70 years old and, in some of them, it reaches 80 years old(2). Such growth in life expectancy has been generating several concerns and attitudes so that the additional life years are lived with quality, well-being and independency (3). However, in many cases elderly patients reach advanced age with several health problems, which demands someone else, being a relative or not, to take care of them. The caregiver is the person in charge of supplementing the functional, temporary or definitive impairment (4). The care duty includes actions which aim at helping the elderly people who are physically or mentally impaired of performing daily practical activities and self-care activities(5). The caregiver may be classified as primary or secondary. The primary caregiver is the one in charge of the daily care of elderly people, being the only person who performs such duty. The secondary caregiver performs such activity occasionally, in a restrict way(5). The caregiver is required to participate in less social activities, to be able to solve problems and to undergo several stressful moments due to such new life routine(6). When the elderly patient has auditory deficiency (or any psychological, physiological or anatomical loss or abnormality of a structure or function(7)), the caregiver is frequently liable for participating the elderly patient in social activities and daily routine, once such kind of deficiency generates reduction of communication ability. The caregiver frequently acts as an 'interpreter', helping the elderly patient in situations in which speech recognition is necessary (meetings, phone calls, doctors' appointments, among others). Consequently, it is believed that there are changes in caregivers' quality of life, once in addition to activity overload, there are changes in family and friend relationships. Life quality involves several meanings (knowledge, experiences, individual and collective values), besides being a social construction which covers historical, social class, stratification and cultural references (8). Due to such multi-dimensional feature, there are several definitions in specialized literature. One of the most used definitions is the one by the World Health Organization (WHO), which defines quality of life as "the individual's perceptions in the context of their culture and value systems, and their personal goals, standards and concerns"(9). The study of individuals' quality of life is an issue which has been raising investigators' interest. Because of that, several instruments have been developed, in the whole world, in order to assess populations' quality of life (generic instruments) or instruments which aim at individuals who suffer from any acute or chronic disease (specific instruments)(10,11). In order to create a generic instrument, based on quality of life definition by WHO, investigators who are involved with WHO proposed an assessment, which has been developed under a cross-cultural scope, and which is based on the idea that quality of life is a subjective and multi-dimensional construction which is made of positive and negative facets(9). Because of some characteristics, such questionnaire, called World Health Organization Quality Of Life (WHOQOL) has been one of the most used ones in the world. In Brazil, besides the original instrument (WHOQOL-100), several other versions have already been translated and validated, including WHOQOL-bref, which is a reduced version of the original questionnaire and allows a reliable and fast assessment of quality of life of individuals, considering four domains: physical health, psychological health, social relationships and environment(9,12). Considering that most of elderly individuals have auditory deficiency and are assisted by caregivers, and that such caregivers may have their quality of life harmed by communication difficulties and that data about such issue have not been obtained in the medical literature, this study has been chosen to be done, which aims at assessing the quality of life of people who take care of elderly individuals with auditory deficiency and at identifying the contribution of use of hearing aids by elderly individuals for the quality of life of such caregivers. The population of this investigation is made of primary caregivers of elderly individuals with auditory deficiency. The sample has been selected through the non-probabilistic, convenient sampling method, made of 30 caregivers of elderly patients. Caregivers who were following elderly patients when they referred to the Otorrhinolaryngology and Head and Neck Surgery Department (Auditory Health Division) of the university hospital were included in this sample. The individuals who were just following the elderly patients at the moment of the evaluation were excluded from the sample (secondary caregivers). The ones who did not want to participate in this investigation and the ones who did not sign the Free and Clear Consent Term (FCCT) were also excluded. Only three caregivers did not agree on participating on this investigation. The components of this sample have been approached at the waiting room of the university Speech Therapy clinic. Once the research objectices were explained, the caregivers who agreed on participating were invited to go to one of the clinic's rooms, in order to sign FCCT and to individually answer the instruments. 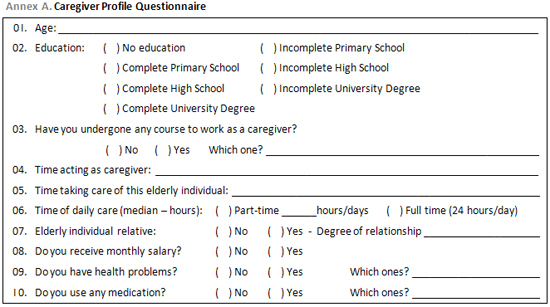 At the data gathering, a questionnaire in interview format was applied, which was specially designed for this study, aiming at obtaining information from the interviewee (ANNEX A). The caregivers have been divided in two groups. The first group was made of 20 caregivers of elderly individuals who suffered from auditory deficiency and who did not use hearing aids, and the second one was made of caregivers of elderly patients who used hearing aids. The group division has been chosen so that the influence of hearing aids could be evaluated. After that, the shorter instrument of quality of life assessment by the World Health Organization (WHO), the WHOQOL-bref, was applied. According to the translators' instructions, the components of the sample were guided to think about their lives during the last two weeks, to read the proposed questions and to sign the column which contained the most proper answer to their case. Because it is a self-applicable instrument, the WHOQOL-bref is self-explained. In case the individual did not know how to read or had reading difficulties, the examiner would read the question. If the question were not understood, it would be read slowly read again, and synonyms or explanations would not be used, in order to avoid the examiner's influence over the caregiver(13). The questions have four scales of answer: intensity (extremely-not at all), capacity (completely-not at all), assessment (very dissatisfied-very satisfied; very poor-very good) and frequency (never-always). Between the extremes there are intermediate answers. For example, between not at all and completely there are a little, moderately and mostly. Each alternative corresponds to 1 to 5. After reading each question, the individual must circle the number which represents the best answer(13). After filling in the questionnaire, the data were inserted in a spreadsheet of the software Statistical Package for Social Science (SPSS) 10.0 for Windows, to calculate the values obtained in each domain (physical, psychological, social relationships and environment), following the sintax determined by the translator(13). The comparison between the groups has been done through the Student t test for independent samples (quantitative variables with normal distribution), Mann-Whitney test (quantitative variables without normal distribution), qui-square test (qualitative variables) and ANOVA one way. In order to verify the presence of co-relation, the co-relation coefficients of Pearson and Spearman have been used. The statistical analysis has been done in the software Statistical Package for Social Science (SPSS) 10.0 for Windows. This project has been approved by the University Ethics Committee, under protocol number 185H/2006, and the rights of confidentiality, volunteering and abandonment have been guaranteed. The results obtained in this study are presented below. The sample components aged from 33 and 84 years, with average 58.5 ± 13.07. Out of the 30 (100%) caregivers, 24 (80%) were female and 6 (20%) were male. Data related to education are presented on Table 1. 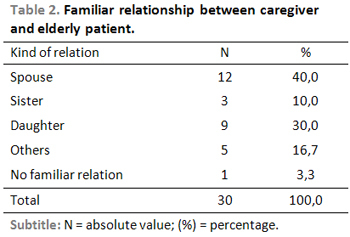 Table 2 shows the family relation between caregivers and elderly individuals. 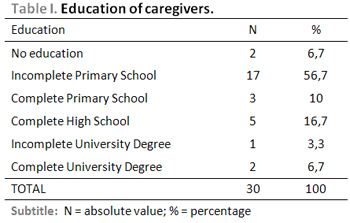 The results presented on Table 3 show that most of caregivers did not undergo any course to perform such duty. The courses done by three components of the sample who had preparation to deal with care included Nursing, Nursing Assistant and a course offered by a church's health department. Among the assessed subjects, the period of time acting as a caregiver varied from 3 to 13 years (6 years average). The time of care with the current elderly patient varied between 2 and 13 years (4,5 years average) and the daily care time carried from 4.5 to 24 hours (24 hours median). In terms of remuneration, it has been verified that out of the 30 (100%) of the caregivers assessed, only 2 (6.7%) received monthly salary to perform such task. It is pointed out that for the data gathering about the time dealing with care, only oral information was obtained, once most of the sample was made of family caregivers, performing such duty without remuneration nor registration, so it was not possible to verify the exact amount of activity time. In terms of caregivers' health, it has been verified that 15 (50%) presented from 1 to 2 health problems (median 1) and used from 1 to 3 medications (median 1). Table 4 and 5 show the general results of the WHOQOL-bref test and the co-relation between its scores and the caregivers' variables. The stratified results according to the groups to which the caregivers belonged are presented below. Out of 30 (100%) components of the sample, 10 (33.3%) would take care of elderly individuals who used hearing aid and 30 (66.7%) would take care of patients who did not use hearing aid. 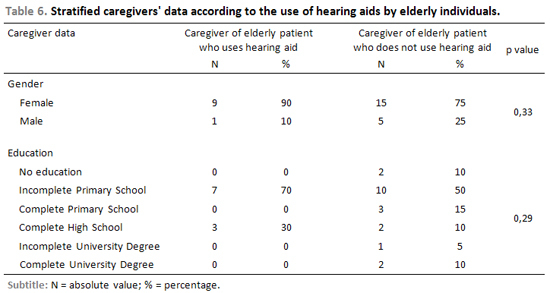 The average age of caregivers of individuals who used hearing aid was 59.5 ± 11,06 years and of caregivers of individuals who did not use hearing aids was 58.0 ± 14.22 years (p = 0.77). Table 6 presents data referring to gender and education of caregivers, according to the use of hearing aids by elderly individuals. Table 7 presents data referring to preparation for care activity, according to the use of hearing aids by elderly individuals. The existence and kind of family relation between the caregiver and he elderly individual becomes evident on Table 8. In terms of caregivers' remuneration, as previously described, only 2 of them (6.7%) would be paid to perform such activity, one would take care of an individual with hearing aid and one would take care of an individual without hearing aid. Table 9 presents data referring to care time and Table 10 presents results in relation to caregivers' health. In terms of the number of diseases presented by caregivers, median was 1 (p = 0.73) in both study groups. The median of the quantity o medication used was 1 by caregivers of individuals who use hearing aids and 2.5 by caregivers of individuals who do not use it (p = 0.20). Table 11 shows the WHOQOL-bref score, according to the use of hearing aids by elderly individuals. The quality of life of 30 (100%) caregivers of elderly individuals was assessed to do this study. Concerning the sample feature, the presented data related to all components of the sample prove that, in terms of age, the data obtained are superior to other data described in the medical literature(14,15,16). In the aforementioned studies, it is pointed out that caregivers of elderly individuals who carry other pathologies have been interviewed, once after extended search for theoretical reference, authors who approached care and hearing deficiency were not found. Most of the individuals of the studied sample were female, with low education level (Table 1), and such results were similar to the ones obtained by other authors(14,15,16,17). Such result may be attributed to the fact that the family members who assume the care responsibility are female, such as daughters and wives (Table 2)(5,17,18,19). Once they are family members, most did not undergo any habilitation course (Table 3) nor receive salary, despite of a daily performance median in full-time period5. Such performance time was expected, also due to the family relationship between the caregiver and the elderly individual. The presented data prove that half of caregivers present heath problems and use medication. Such data of presence of disease and medication use by caregivers was also expected, once many caregivers are also elderly, carry chronic diseases and need control medication. 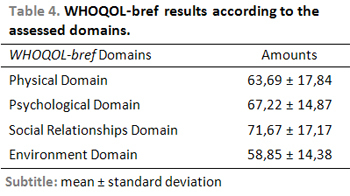 In terms of caregivers' quality of life (Table 4), the WHOQOL-bref test results were analysed according to the four domains. The caregivers of the sample presented higher scores in the social domain, followed by the psychological, physical and environment domains. Such data show that the quality of life of caregivers who deal with elderly individuals who carry auditory deficiency is affected, mainly in the physical and environment domains. The low scores of physical domain may be explained by caregivers' age, once the questions refer to pain and discomforts, medication use, sleep and rest, energy and fatigue, daily life activities and labor capacity. In terms of environment domain, the questions approach topics such as security, financial resources, health and social care, transportation, opportunity for information, participation on leisure activities. It is believed that the lowest score was obtained in such domain due to the fact that security and environment (pollution, noise, traffic and climate) affects everybody, apart from age and activity. The other topics of such domain are severely influenced by the social-economic matter. That specific item has not been investigated by the researches, but it is believed that most of the assessed caregivers come from poorer classes, even by their report of years waiting for an auditory assessment by the Brazilian Unique Health System, due to he fact that they cannot afford private health care. Studies prove that the family income of elderly individuals is determinant to choose the kind of health care such individual will receive (public or private care)(20). Therefore, it is believed that the lack of financial resources prevent better scores to be obtained. The data analysis proves co-relation between the age of the caregiver and the psychological domain of WHOQOL-bref (p = 0.03) and the inverse co-relation of quantity of medication that thecaregiver uses and the physical domain of WHOQOL-bref (p = 0.008) (Table 5). Consequently, it is verified that the younger the caregiver is, the more his/her quality of life is affected in the physical domain. That may be explained by the fact that such activity may cause stress and emotional overload, in addition to depravation of activities and social living. The older the caregiver is, the more life experience and resiliency he/she has, thus he/she will have more ability to accept facts. Concerning medication which the caregiver uses, it has been verified that the higher his/her number, more affected his/her quality of life is affected in the physical aspect. That may be explained by the fact that the higher the number of diseases, the higher the number of medications and worse the physical conditions. The caregivers may present diseases due to their activities, thus increasing health problems and the number of medications(21). 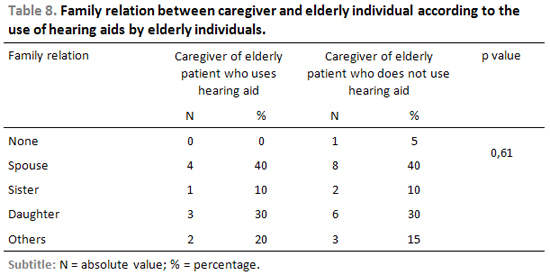 Tables 6, 7, 8, 9 and 10 presented caregiver data, according to the use of hearing aids by elderly individuals. Analysing the profile data of caregivers of elderly individuals who use hearing aids or not (age, gender, education, special care course, family relation, salary, time working as caregiver, time taking care of that specific individual, hours per day, caregiver health problems and number of medications used by the caregiver), there was no statistically significant difference, what demonstrates that the groups are homogeneous and the only factor which differs them is the use of hearing aids by the elderly individuals. Due to that, the influence of use of hearing aids by elderly individuals on the quality of life of caregivers may be analyzed. The data were presented on Table 11. It is pointed out that the average time of use of hearing aid was 30 days. In the group of individuals who take care of elderly patients who use hearing aids, the best WHOQOL-bref scores were obtained in the social domain (81.67 ± 11.65), followed by the psychological domain (73.75 ± 13.89), physical domain (72.50 ± 13.15) and environment domain (61.56 ± 16.07). The scores were generally lower in the group of individuals who take care of elderly patients who do not use hearing aids. The social domain had the highest score (66.67 ± 17.52), followed by the psychological domain (63.95 ± 14.57), physical domain (59.28 ± 18.52) and by environment domain (57.50 ± 13.69). The statistically significant difference has been observed only in the social domain (p = 0.02), when the questions related to social relations, social support and social activities are investigated. Such results may be explained by the fact that the use of hearing aid by elderly individuals brings better speech recognition, making communication and care easier. In addition to this, with better audition, the elderly individuals participates on social activities more, reducing the isolation which the auditory deficiency causes. Consequenlty, the caregiver will be less overloaded and will have more opportunities of social life, improving such aspect in his/her quality of life. The reduction of the isolation of the elderly individuals also brings the reduction of isolation of caregivers, reversing the picture of distance to social life (4.16). Consequently, it is believed that the auditory assessment must be done even when there are no specific complaints, what is very common, so that the diagnosis is done in an early stage, thus enabling the access to orientation and rehabilitation and keeping quality of life well, not only in relation to elderly individuals, but also in relation to their family members and their caregivers. The results obtained suggest that caregivers of elderly patients with auditory deficiency have their quality of life affected. The use of hearing aid by elderly individuals seems to contribute to the caregivers' quality of life, once it is less harmed when that happens. 3. Gonçalves A, Becker Junior B, Milão LF, Teixeira AR. Envelhecimento, promoção de saúde e atividade física: algumas reflexões. In: Becker Jr B e Gonçalves CJS. Fronteiras em ciências da atividade física e do esporte. Porto Alegre: Nova Prova; 2006. p. 51-64. 6. Bocchi SCM. Vivenciando a sobrecarga ao vir-a-ser um cuidador familiar de pessoa com acidente vascular cerebral (AVC): análise do conhecimento. Rev Latinoam Enfermagem 2004; 12(1):115-21. 10. Dantas RAS, Sawada NO, Malerbo MB. Pesquisas sobre qualidade de vida: revisão da produção científica das universidades públicas do estado de São Paulo. Revista Latino-Americana de Enfermagem 2003; 11(4):532-8. 11. Minayo MCS, Hartz ZMA, Buss PM. Qualidade de vida e saúde: um debate necessário. Ciência e Saúde Coletiva 2000; 5:7-18. 12. Fleck MPA, Louzada S, Xavier M, Chachamovich E, Vieira G, Santos L et al. Aplicação da versão em português do instrumento abreviado de avaliação da qualidade de vida "WHOQOL-bref". Rev Saúde Pública 2000; 34(2):178-83. 20. Bós A, Bós AJG. Determinantes na escolha entre atendimento de saúde privada e pública por idosos. Rev Saúde Pública 2004; 38(1):113-20. 1. Speech Therapist, post-graduating in Speech Therapy: major in Audiology at Universidade Luterana do Brasil (ULBRA). Clinical Speech Therapist. 2. Doctor's degree on Biomedical Gerontology PUC/RS. Speech Therapist and Gerontologist, Speech Therapy Professor - ULBRA. 3. Post-doctor's degree on Otorrhinolaryngology at Pittsburgh University - USA. Otorrhinolaryngology Assistant Professorat ULBRA Medical School and at the Morphological Sciences Department at UFRGS. Chief of the Otorrhinolaryngology and Head and Neck Surgery department at Hospital Universitário da ULBRA. 4. Master's degree on Speech Disorders. Universidade Tuiuti do Paraná. Speech Therapy of the High Complexity in Auditory Health Department of Hospital Universitário da ULBRA. 5. Speech Therapist of the High Complexity in Auditory Health Department of Hospital Universitário da ULBRA.